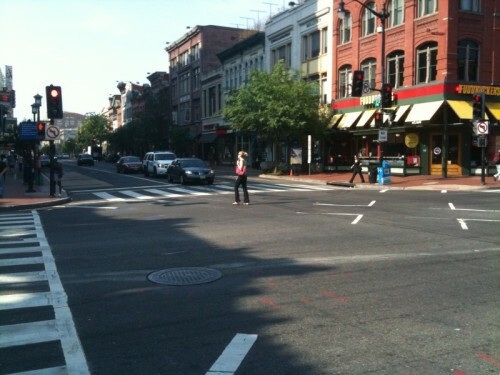 PoPville » Diagonal Crosswalk in Columbia Heights? Diagonal Crosswalk in Columbia Heights? 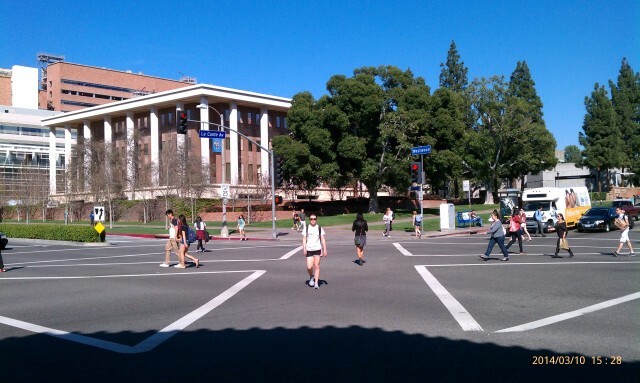 I was near the UCLA campus this weekend and noticed several of these diagonal crosswalks. It looked like an efficient way to move large numbers of pedestrians at once, thus clearing the way for smoother automobile traffic, since all crosswalks have a walk sign at the same time. I’m wondering if one of these would work at the intersection of 14th and Irving, which is one of the worst intersections in Columbia Heights. Metro Buses would be able to make a right turn from Irving to Southbound 14th without having to wait for pedestrians. During rush hour, sometimes only one or two cars are able to make a right or left turn after pedestrians have cleared the crosswalks. “The District Department of Transportation is launching a new pilot program aimed at providing safer crossings for pedestrians at one of the District’s most traversed intersections: 7th and H streets, NW in Chinatown. The new traffic pattern, commonly called a “Barnes Dance,” allows pedestrians to cross in every direction, including diagonally, at the same time while vehicles on all four sides of the intersection are stopped at a red signal. The change is scheduled to be implemented on Wednesday, May 12 at 10 am. Statistics show there were 35 total vehicle crashes at that intersection with 9 injuries (4 involving pedestrians) in 2009, and a total of 15 pedestrians injured from 2005-2008.